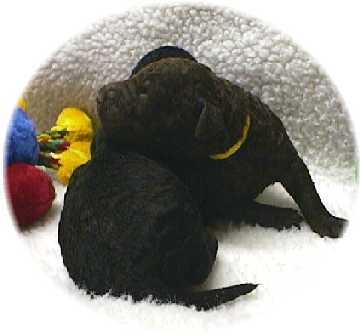 Neonatal Period, Birth to 2 weeks: Puppies are born with eyes and ears closed, Their experiences are thru touch and smell. They are able to sense heat, cold, and texture. They are totally dependent upon their mother for everything, even the stimulation of bowl and bladder function. 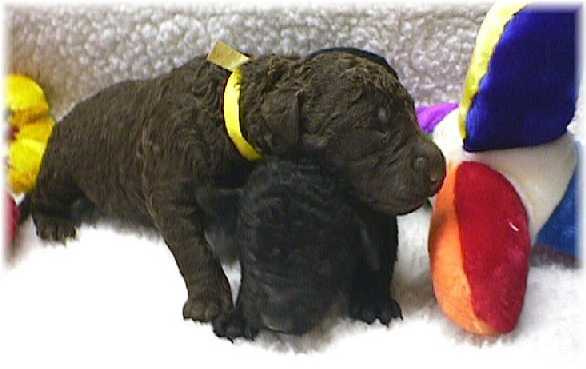 Transitional, 14 to 21 days: The puppy’s nervous system undergoes rapid development. The eyes and ears open, and baby teeth appear. He begins to stand up and by three weeks will try to explore his environment. He begins to interact with littermates and learns play behavior. 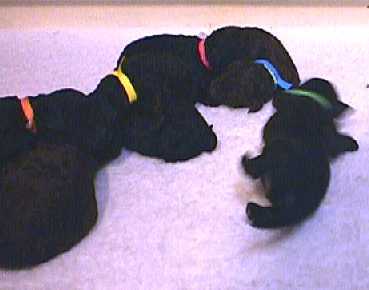 By 21 days the puppies are able to lap food from a bowl, though they continue to nurse. The pups are starting to try to walk more. Very wobbly and unsteady, they teeter up and most of the time go rolling onto their backs. The fleece whelping pads offer good footing for the pups. Some breeders use newspaper in the box, since it doesn't have to be washed. The pups don't get good footing on the slick paper, and as a result often don't walk as quickly as they normally would. One thing that needs to be watched for at this age is any Swimmer Puppies. The term swimmer is used to describe a puppy that paddles its legs much like a turtle but is unable to stand. A puppy should be standing and walking by three weeks of age. As a result of weak muscles in the rear limbs, swimmers are generally unable to stand at the normal age. Slippery floors may worsen or in some cases may even cause swimmer puppies. This is not always the case because swimmer puppies are also seen when a rough surface is used for raising puppies. In any event, an affected puppy should be placed on a rough rather than slippery surface. now seems to be gaining on her. Blue Collar Fastest boy to get off the cold cloth. very relaxed when Supine Still the most passive. Now the largest in the litter. By far the best nurser Small and scrappy. loud nurser. All the pups are getting more active, and more vocal during the Bio Sensor exercises. Some still get very much relaxed while in the Supine position. Some are starting to crawl rather quickly off the cold moist towel. Others know they don't like it, but do not know what to do about it. (i.e., just holler!) The boys seem very equal in size and activity level. The boys also seem to hang together. Many times all 4 boys will either be sleeping in a pile in-between Gabby's front legs, or all four will be the only ones nursing. I've been at a seminar for the last several days. It was led by Sue Ailsby -- a delightful woman and incredible trainer. I was blown away and thoroughly entertained by the seminar. She has *soooo* much knowledge about so many aspects of training, behavior, conformation, competition, etc., and let's not *even* talk about how incredible her seminar (and service) dog, Scuba is. The seminar was four days. Each day covered a completely different topic, and attendees were allowed to pick and choose which days to attend. Thanks to the generosity of my friend Kyle (who gave me a place to stay AND provided transportation AND covered food) I was lucky enough to attend all four days. The first day, we covered clicker basics and household manners. My favorite takeaway: "No matter what else you train your dog to do, there's no higher calling for a dog than to be a pet." The second day, competition obedience. I learned a terrific new way to teach competition heeling. The third day was teaching clicker classes. All I can say is WOW!! I'm encouraging Sue to present a couple of topics from this day at the next APDT conference. The final day was "attendee choice." We chose to spend the morning on structure and movement -- again, WOW! -- and the afternoon on a range of topics including dog-dog interaction, starting puppies, and agility. The structure and movement stuff was incredible. I learned *so* much about how a dog is put together, how proper structure "works," and how various problems affect movement. Many attendees had dogs with them, so she spent quite a bit of time helping the class evaluate those dogs. Fabulous! She recommended a couple of videos -- "Dog Steps" and "A Key to Movement" -- to learn more. I'll add them to my Christmas wish list, which (thanks to this puppy) is getting longer and longer. Eyes still not open. When Gabby stands up to leave the box, she usually has a few pups that hang on with suction power. Its amazing the hold they get, and are able to cling to her for a few seconds before falling off. The pups make a funny growling sound and scramble around looking for her. She spends a bit more time away from them. A few days ago I still had to put a leash on her to get her to go outside. Now she takes more time to explore the yard. If she hears even one squeak from inside the house, she rushes to the door to be let in. Gabby has commandeered some of the toys in my stash that were set aside for the pups. Im not sure the pups know what to think of these odd unmoving litter mates they have adopted. Wait till they find out what sounds they make! At 5am potty break, two pups had eyes open. Red collar liver girl and blue collar black boy. 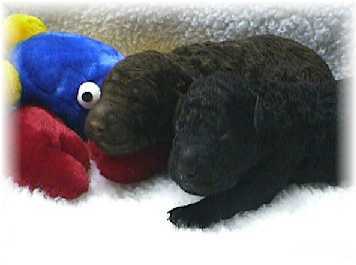 As the day goes on, more pups are starting to get that wet eye look, and have partially opened eyes. It will be a few days before they will be able to see anything but shadows.